The Alarm.com In-App Panel Panic monitoring station supported feature can expedite the dispatch of emergency personnel when help is needed at home. When the panel is not in arm’s reach, and the keyfob is out of range, a homeowner can open up the Alarm.com app and have all their panel’s panic buttons available in the app. 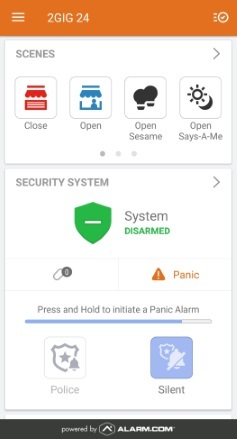 If enabled on the account, In-App Panel Panic is always available on the Security System card on the home page of the Alarm.com app. Important: While the Alarm.com app supports Fire, Medical, Police, and Silent panics, it will only display those that the panel supports. If the panel does not support any panic buttons, the app will by default display a silent panic button. This feature is added to all Alarm.com customer with interactive services. If you wish to opt-out of the Cancel/Verify feature please email Service@AdvancedSecurityLLC.com and include your Name, Address and password along with your desire to Opt-out of this feature. In the Security System card, tap Panic. Press and hold the type of panic to be triggered. 4. After three second countdown in which the panic can be canceled or immediately sent, it will successfully be sent to the monitoring station. 5. Tap Close to wait for assistance or Disarm to disarm the panel. In-App Panel Panic reflects options that are available at the panel, in addition to Silent. Note: In the Audible Panic compatibility column below, Yes means that Police, Fire, and Medical panics are available unless noted otherwise. *Only Police and Silent panics are available at this time. **In-app panel panic is not compatible with DSC PowerSeries Neo panels in UL mode. If UL mode is enabled, app-based panics will not forward to the monitoring station. Note: Panel support is still under development, and announcements will be made through release notes as new panels are supported. What happens when the panic button is pressed? When the customer presses and holds any of the available panic buttons, a signal is sent from the Alarm.com app through Alarm.com’s backend to the monitoring station and communicates the selection. Another signal is sent simultaneously to the panel to register the command and trigger an audible alarm if applicable. What if the customer sends a Panic by mistake? After pressing the panic button, a new screen pops up with a three-second countdown, below the countdown is a Disarm button. Tapping Disarm will negate the panic signal that was just triggered. Will assistance be sent to the customer’s home location or their current geographic location? Sending a panic from with the In-App Panel Panic interface will act as if a panic is being sent from the panel. Messaging in the app will reinforce that when a signal is sent, emergency personnel will be dispatched to the home/panel location. Emergency personnel will not arrive to the customer’s geographic location. They will only go to the address listed on your monitoring station account. It is encouraged to keep that information up-to-date. The New Alarm.com Cancel/Verify gives the opportunity for users to respond to alarm events directly and to communicate to a monitoring station when the cause might be accidental or a real emergency. This feature is added to all Alarm.com customer with interactive services. If you wish to opt-out of the Cancel/Verify feature please email Service@AdvancedSecurityLLC.com and include your Name, Address and password along with your desire to Opt-out of this feature. Important: Cancel/Verify only appears when the panel has registered that sensors have been tripped and the system is in an alarm state. When the system is in alarm, log into the Customer app. Use the Time Remaining to quickly review video cameras or communicate with those at home. Press and hold Cancel Alarm for three seconds. A confirmation screen will pop-up to let users know the signal has been canceled. Press and hold Verify Alarm for three seconds. A confirmation screen will pop-up to let users know the signal has been confirmed. The Cancel/Verify monitoring station supported feature has the potential to help reduce the number of accidental alarm dispatches made each year. A user can quickly resolve an alarm situation with the press of a button if the cause is known, accidental or emergency. Additionally, accidental dispatches can result in fines at all levels of accountability: users, dealer, and monitoring stations. Not to mention distracting emergency personnel from potential real emergencies. With the press of a button and without needing to wait for a call from a monitoring station, an entire situation can be resolved saving time and money. When can Cancel/Verify be used? Whenever an alarm is triggered at the home location and the entry delay timer has elapsed, the alarm signal will be sent to the monitoring station, and the Cancel/Verify card will appear in the Alarm.com app. Cancel/Verify appears for all alarm events but will not appear in the app outside of an alarm event. How long is Cancel/Verify active during an alarm? Cancel/Verify will remain active in the Alarm.com app until 2 minutes past the alarm signal was sent. What does the two minute counter represent? The two minutes is the estimated amount of time for a monitoring station to receive, process, act on, and dispatch based on an alarm signal or event. Response times vary between monitoring stations so a user’s signal may be sent after dispatch has occurred while still in the two minute Cancel/Verify window. Monitoring stations will still receive the signal if sent before the time has elapsed and may adjust their response accordingly. This time varies between monitoring stations. Contact the monitoring station account rep to learn how they handle Cancel/Verify. Are alarm signals held until a Cancel/Verify button is pressed? No. All alarm signals still send as expected and no communications are inhibited in any way. The user is able to interact with the Cancel/Verify buttons once the signal has been sent to and received by the monitoring station. What happens when users press a button? When users press and hold either False Alarm or Confirm Alarm, a signal is sent from the Alarm.com app through Alarm.com’s backend to the monitoring station and communicates the selection. Depending at what stage the monitoring station is at with handling the original alarm signal, the selection may resolve situational concerns or may help influence post-dispatch communications between the monitoring station and the emergency personnel. When pressing False Alarm, a disarm signal is also sent to the panel indicating a safe environment, similar to disarming directly at the panel. Note: The disarm command in the Event History will list from which login name the disarm was sent. Why is there a five minute refresh period? It is likely that alarms triggered within a five minute period are linked to the same situation. Monitoring Stations will still receive all alarms as expected, and the Cancel/Verify signal will provide a contextual clue to the cause/urgency, and the reps will interpret for the scenario based on the signal sent from the user. The monitoring station may deem within their own protocol to still call in any situation as a follow-up, each monitoring station is individually consulted prior to providing support for the features. AT&T plans to end service on its 3G wireless networks in February 2022. 3G/4G new activations will no longer be permitted after June 26, 2019. This means you will no longer be able to activate a new 3G/4G communicator for an AlarmNet account. Existing 3G/4G communicators that are currently registered will continue to communicate to the central station. If you cancel a registered/billable 3G/4G account on or after June 26, 2019, you cannot reactivate the 3G/4G communicator because reactivation will be considered a new activation. Resideo has expanded its communicator portfolio to include LTE radios, which provides a transition to new cellular technology, and offers maximum network longevity. Alarm.com is making user code management even easier for your customers! Starting next week, December 10th 2018, customers will be able to edit users, assign codes and set access timeframes right from the Alarm.com mobile app on their smartphones or tablets. Customers must have the latest version of the Alarm.com mobile app downloaded on their phones or tablets to manage user codes. 1. Will the IPCAM-WIC1 and IPCAM-WIC2 work with a dual-band router? What is the wireless frequency used by the cameras? Yes. All cameras work with any dual-band router. The IPCAM-WIC1 and IPCAM-WOC1 works only on the 2.4 GHz wireless frequency.The IPCAM-WIC2 works on both 2.4 and 5.0 GHz wireless frequencies. No. The IPCAM-WIC1 does not come with a flexible mounting kit. It can be attached to a wall with the included screw. The IPCAM-WIC2 has a flexible mount that can attach to a wall or ceiling. Both cameras can be set on a flat surface. Yes. The IPCAM-WOC1 is a standard bullet camera and is designed for quick and flexible wall orceiling mount installation. No. It is not recommended since improper splicing could damage the camera and void the warranty. Use the included extension cable and pigtail power cable to extend it up to 200 feet using a 18 AWG wire. Interlogix UltraSync Video Doorbell-Know who’s there even when you aren’t! 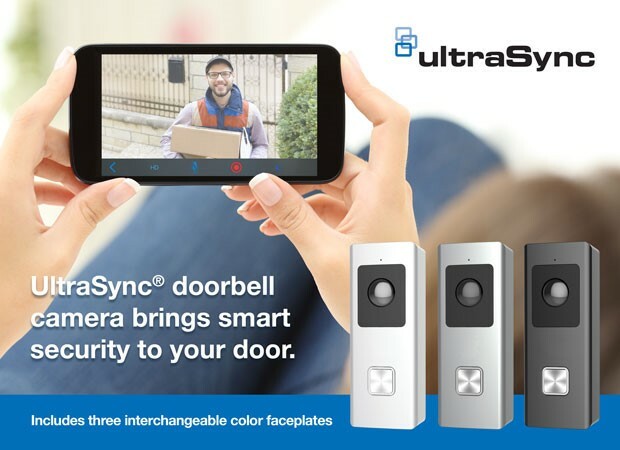 The UltraSync Doorbell Camera features real-time and recorded high definition video and audio. You can set up the doorbell camera to send notifications to your mobile device when motion is detected and when the doorbell button is pressed. Speak to the visitor via 2-way audio through the UltraSync mobile app. The doorbell camera can also be used to trigger automations like turning on porch lights. The doorbell works with existing mechanical doorbells and utilizes power via existing doorbell wires. 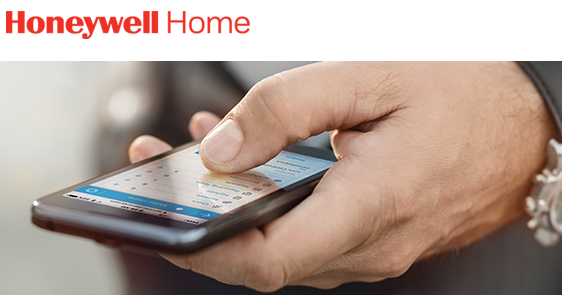 Honeywell Total Connect Tracking Services accounts are offered through CDMA technology, and effective June 30, 2018, CDMA activations will no longer be permitted. Tracking Services accounts include the following part numbers: TCVT2, TCAT and TCAT-EB. Once stock is depleted, Honeywell Total Connect Tracking Services will be discontinued. Any existing account will continue to be maintained and supported until the sunset date of December 31, 2022. AlarmNet will continue to support the provisioning of Verizon CDMA communicator devices with a manufacturing date of March 1, 2018 and forward. These communicators are sold with the SIMs pre-activated by Verizon and may be added to the AlarmNet network until December 21, 2018. Any existing CDMA communicators that are currently registered will continue to communicate and be supported by AlarmNet as Verizon has extended its CDMA network to Honeywell through December 31, 2022, under Honeywell’s current longevity agreement with Verizon. If you cancel an existing CDMA account and then attempt to activate the device, this is considered a new activation and will not be eligible to be added to the AlarmNet network. Honeywell is expanding its communicator portfolio to include LTE radios, which provides a transition to new cellular technology, and offers maximum network longevity.